This is basically a simple program which will help keep your Windows personal computer's time setting up to date and synchronized with standard NIST time services. It also supports SNTP and TIME protocols. 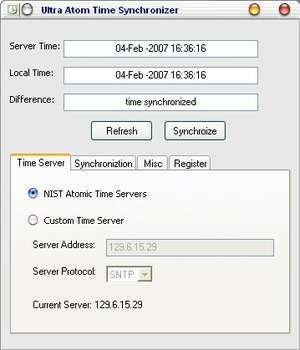 Users of Time Synchronizer can have the PC time synched on regular intervals or on boot. Version 1.0.2013.612 is a freeware program which does not have restrictions and it's free so it doesn't cost anything. For security reasons, you should also check out the Time Synchronizer download at LO4D.com which includes virus and malware tests. Additional screenshots of this application download may be available, too.